There is no doubt that you will meet a clogged sink, sooner or later. It’s a normal thing. 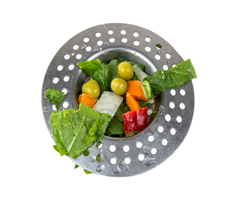 When you use your sink to clean your pots and pans, or wash vegetables or fruits, some small things will get into the sink drain along with the running water. These substances will stick onto your pipes, and pile up over time, thus it gives rise to clogs. Luckily, it is not a difficult thing to clear drain clogs. 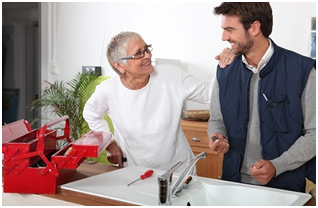 With the right supplies and plumbing tools, you sink will be smooth again. 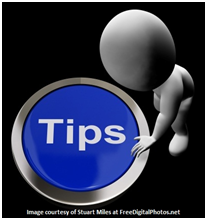 One important tip! DO NOT USE CHEMICAL DRAIN CLEANERS! The irritating chemicals will swallow your pipes. 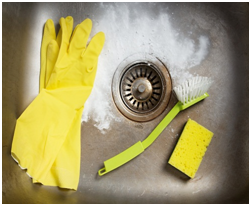 Here we will show you a detailed guide on how to clear a clogged kitchen sink. From this step-by-step guide you will get your sink problem fix in a short time. 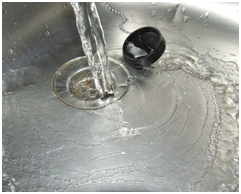 √ When scoop the water, you can inspect the drain. Remove the food particles which block in the hole if it has. Just Turn on the faucet to check if it can solve this problem. 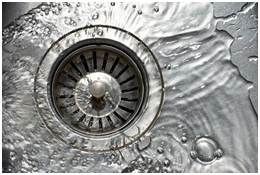 √ Just try a popular remedy if the clog happens in the pipe: Baking soda and vinegar. Pour a cup of baking soda into the drain and then a cup of vinegar. Put the plug on, and these two things will create a chemical reaction. √ Wait for a few minutes with patience, as the baking soda combines with vinegar and they will fizzes out the sticky particles on the pipe walls. 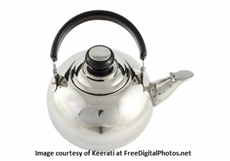 Pour a kettle of boiling water to wash them when you no longer hear any fizzing sound. 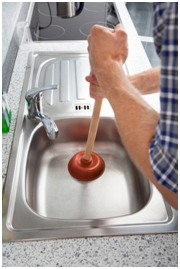 √ If the above way could not settle out the clog problem, it is time to use your old plunger. Put some water in the sink to make sure that plunger’s rubber part gets wet. You need to make sure that the position is in the middle of the hole, and then start to plunge in a certain pace. Repeat this movement around 15 times then test if the clog is still here. 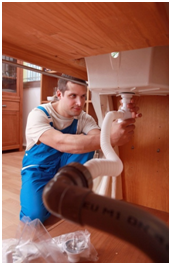 √ If the clog is too stubborn, use your plumbing snake now. Separate the trap under the sink and the snake. Turn the crank clockwise for further inserting the snake and go ahead to push the wire until the clog is broken into dinky pieces. After all these methods have been done and your clog problem still not solve, your vents or the clog problem may be quite serious. Time to call a professional team to help you to get this clog problem solved. Follow the above steps strictly then your clogged sink problem should be worked out at any time. Feel free to visit our website www.builderelements.com for more installation/clearing methods for building materials. A blocked drain became too problematic for all of us in the family, because it hindered quick passage of waste water, so we decided to call a drain expert immediately. He cleared the mess in a tech-friendly manner, and it prevented back flow of waste water and freed us from all worries. I am going to remodel my kitchen by replacing old faucets. So, I need some good quality kitchen faucets. Recently I visit metal kitchen sink faucets this site and saw lots of kitchen faucets. If you had more insight into it, I would much appreciate it. Thank you. Why Choose Glass Mosaic Tile in Modern Days? BuilderElements. Simple theme. Theme images by gaffera. Powered by Blogger.